Beautiful Recitation of Surah’s and Ayat to be used in Ruqyah (Qur’anic Healing) recited by the world renowned Hafiz Shaykh Yahya Hawwa. To cure black magic the following verses from the Qur’aan should be recited: on water, some of which is drank and the rest is used to take a bath. verse Al-Kursi (2:255), surah Al-Kafiroon (109), surah 112, 113, 114 ; the verses which mention magic, which are: in surah Al-Baqarah (2:102 ), Al-A’raaf (7:117-119), Yunus (10:79-82), and Taha (20:65-69). 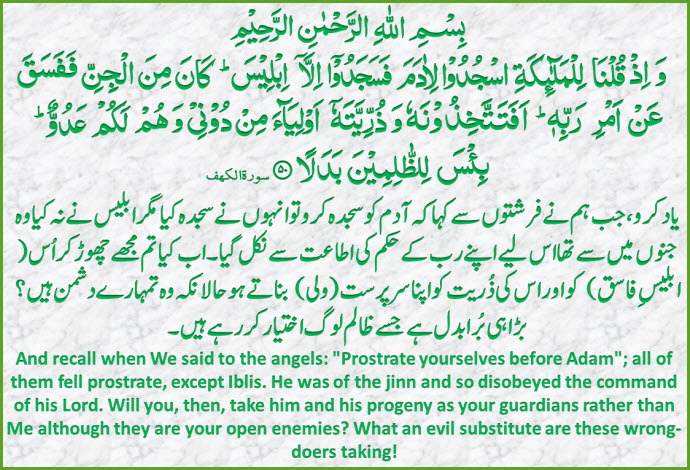 Many articles i come across, writers are talking about and trying to prove that Iblis was not from the Jinns, so some of them tries to claim he was from Angels some says some others. Anyway as a Muslim we believe on Quran and Sunnah only, when in Quran ALLAH swt clearly says that Iblis was from the Jinns. Then why there is a discussion or questions that Was he from the jinns? And [mention] when We said to the angels, “Prostrate to Adam,” and they prostrated, except for Iblees. He was of the jinn and departed from the command of his Lord. Then will you take him and his descendants as allies other than Me while they are enemies to you? Wretched it is for the wrongdoers as an exchange. Make fasting fun for your kids. Very beautiful chart to print for your kids in Ramadan. The word talisman comes from the Arabic word, tilsam which itself comes from the Greek word telos which means to consecrate or to initiate into the mysteries. A talisman can be defined as, “An object that has apparently magical or miraculous effects and that can avert misfortune and bring good fortune when acquired”. According to Dr. J. Knappert, the word ‘amulet’ was originally derived from the Greek word ‘amylon’ meaning ‘food’, which were offered at places where ‘spirits’ were thought to pass, in order to please them and avoid their harm. [An Encyclopaedia of Myth and Legend – African Mythology]. The word taweez is an Urdu rendering of the Arabic word ‘ta’weedh’ which is another word used for tameemah. A tameemah can be defined as an object which is hung on someone or something with the belief that it has the power to repel harm or bring about good fortune. Therefore the words taweez and tameemah are often translated as amulet, charm or talisman. The reality today is that most taweez which are sold to unaware victims contain things which no layman can decipher! These taweez contain numbers, grids, letters, diagrams, symbols, etc. which are all based on the practices of magicians and Cabbalists. In some cases, taweez have been found to contain supplications to other than ALLAH, such as Angels, Prophets and even Jinns! Not only is this ascribing partners to ALLAH – as none can answer supplications except HIM – but it also bears likeness to the taweez used by the Pre-Islamic Arabs and people of other religions who call upon ‘spirits’ to achieve their goals! Every taweez has entities / jinn attached to it. They serve as slaves to that taweez. And in this way they possess you and can play with your psyche too. These entities relieve you from a certain illness or problem for a while. For example, if you get scared at night, these jinns will deal with other jinns around you so that they should not bother you but they are allowed to live with you. You are also like a magnet for other entities if you are wearing any taweez. They are attached with you protecting you from smaller problems but in the longer run creating a bigger problem. Or maybe putting you in a lifetime of SHIRK. After an appointed time they start troubling you themselves so that you would go back to the peer / healer (considering the fact that your previous problem was solved by the taweez given by the healer). The most dangerous part is that there are cases in which a healer sends his jinns with the client to his house to make a truce, pact or deal with the jinns already residing there. The deal is to ask the previous jinns to leave the client alone for sometime, hence creating an illusion that the client is healed. Jinns from both parties (i.e jinns sent by a magician and jinns sent by a healer) reside with the client together. The client’s faith in the healer increases and he bestows the healer with gifts and money.After sometime the jinns are allowed to bother the client again, making the client run back to the healer. This process continues for a lifetime. This deal is only possible if the jinns possessed by the healer are stronger than the ones already present with the client in his house.Alternatively, if the healer’s jinns are not stronger than the ones already present, a fatal war begins. The war is so intense that the client can go into coma or in extreme situations die.Many people have been victims to this phenomenon. ALLAH forgive us! People do argue that they took their family to a certain peer/ healer and he got healed or they took their infertile wife and after receiving the taweez they were blessed with a child. What they fail to realize is that cures are not possible without the will of ALLAH. It was already written that the wife would have a child one day, but the real test was which path will the couple adopt to seek the cure, the right path or the wrong path. The Qur’an was revealed to be recited and followed; its commandments to be obeyed and its prohibitions heeded, its information to be believed and its limits to be adhered to, its parables and stories to serve as lessons and not to be hanged on walls or around necks. The numerals 786 or any other numerals in no way represent ‘Bismillaah al-Rahmaan al-Raheem’ or other Surahs of the noble Qur’ân and is not the Sunnah either. “Verily, We have sent it down as an Arabic Qur’ân in order that you may understand” (12:2). “….So RECITE as much of the Qur’ân as may be easy (for you),…” (73:20). Now would one recite the Qur’an if it is reduced to numbers? As an example, we shall reduce the Surah Fatihah to numerical figures for the benefit of the reader. Does this mean that merely reading 1018 we have read the whole of Soorah al-Fatiha? Then why to recite verses, call numbers instead. This old game of numbers was practiced by the ancient Egyptians, as did many other civilizations. Islam came to ELIMINATE ALL such superstitions, mysteries and numerological mambo-jumbo. However, Muslims are still enslaved to the number game. Prophet Muhammad (صلى الله عليه وسلم) in his letters to different heads of states and governments, used the holy words at the top. Therefore, whosoever uses 786 with the intention to obtain ALLAH’s blessings, is a misguided person and any attempt to justify it, is ignorance. More astonishing is that fact that ‘786’ is an aggregation of the numbers of Hindu ‘Lord Hari Krishna’. H(a)iri Kr(i)shna. h-5, r-200, r-10, k-20, r-200, sh-300, n-50, a-1 = Aggregate of 786, Thus, the aggregate number of these letters (Hari Krishna) equals 786. This is also the case of ‘Bismillaah al-Rahmaan al-Raheem’. How can the numerical value of a quranic verse (basis for monotheism) be similar to a god of polytheism? Therefore, it is necessary to avoid using this number to avoid the danger of being indulged in innovations. Islam’s foundation is laid on the belief in Tawheed (oneness of ALLAH). If we associate anyone with ALLAH’s exalted names orally or practically, we would be committing infidelity which is an unpardonable sin. The Qur’ân warns us, one who finds a rival against ALLAH, ALLAH will never allow him to enter paradise, and his abode is the hell. The letters by the Prophet (صلى الله عليه وسلم) to non-Muslim Kings and chiefs bear the holy words ‘Bismillaah al-Rahmaan al-Raheem’. This was also the case of his noble companions. But nowadays we write 786 instead with the justification that papers are thrown, or disgraced. The Prophet (صلى الله عليه وسلم) and his noble companions respected every verse more than anyone else in this world. Was the verse, ‘Today I completed your religion for you’, revealed by ALLAH to the Prophet (صلى الله عليه وسلم) or to the so called scholars of our age who are all bent to CHANGE the Divine principles. Now, when it became known that ‘786’ is written in place of Hindu, ‘Lord Krishna’, and has no significance in the Holy Qur’ân and Sunnah, it is obviously an innovation and goes against the Divine doctrine of ‘Obey Allaah and His Prophet (صلى الله عليه وسلم). ‘Bismillaah al-Rahmaan al-Raheem’ holds great significance in the Qur’ân and Muslims are ordered to begin any work but in the names ALLAH, not in the number of ‘786’ or any other substitution. I have been known to live in a bubble – I know only those things that are relevant to me and mine; it’s only when I happen to chance by a switched-on TV, or converse with someone who has chanced by it, that I find out that all is not well in the world. At one point, some two years ago, I decided to leave the safety of my bubble and learn about what has happened and is happening in the world by enrolling into a painful two-year Masters program in International Relations (hence, the lack of blogging on my part!) Having finished with it just recently, I realized my bubble is a lot more comfortable and hence I returned to it, settling very happily into the misery-free vacuum inside! I found out in conversation with my mother, that a very near relative (who has mashAllah left a lot of her bida’as since she has found the deen), sacrifices a goat the 13th of every Safar in order to ward off evil and bad luck. “Whaa? !” was the syllable that emitted from my mouth on hearing something so ridiculous! My mom gave me a puzzled look and repeated what she had said, commenting, “You know that people believe Safar to be a month of bad omens, right?” Well, I didn’t, so it was time to go knocking at some doors! Here is what my limited research revealed: The month of Safar is considered to be full of misfortune and calamities and one must recite Surah Muzammil 313 times in order to be saved from them. The first to the thirteenth of Safar is ill-fortune and evil; however, the person who distributes food or money on the 13th of Safar will be saved from its ill-fortune. Also, whoever commences any important venture, business etc. during this month will have bad luck. One must instead make 365 balls of flour and toss them into the sea or rivers in order to counter bad omens and to increase Rizq! Also, a nikah performed in this month would not be successful or result in an unhappy marriage. The list goes on, but here’s enough to fuel your imagination! 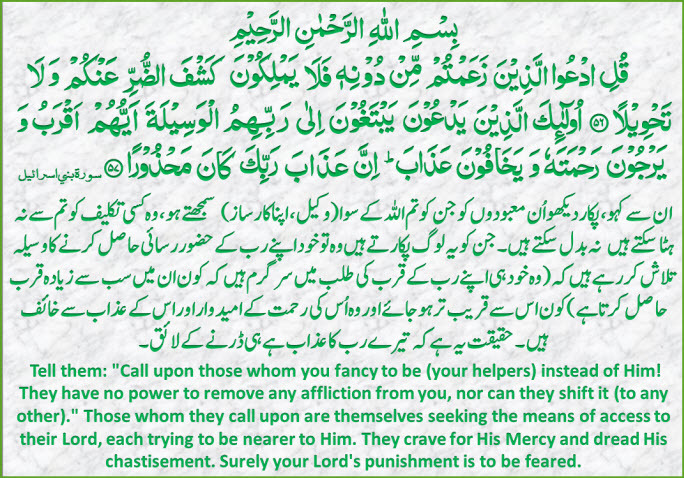 It almost sounds like a bad chain letter, only a million times more dangerous as it can destroy our Iman and Aqeedah! Now, you’d wonder why Safar has been singled out so? A little more research revealed that this concept actually goes back to the days of Jahiliyya! The Arabs were a warring nation; small arguments and disputes would turn into feuds and wars that lasted not only for years, but sometimes spanned even generations. However, even back then, the Arabs observed the sacred months of Rajab, Dhul Q’ada, Dhul Hijja, and Muharram, and would abstain from fighting in them. They would however be waiting impatiently for Safar; for as soon as Safar rolled about, the men would proceed to settle scores with their rivals, heading out for battles while leaving their houses empty (hence the name Safar as the word Safar means empty or vacant). As a result of the resumption of killings and fighting in the month of Safar, the Arabs started regarding it as a month of ill-fate and bad luck. History, sadly, reveals that man loves to blame, and even though the Arabs went off in a killing-spree, it was poor Safar which bore the brunt of the blame! The advent of Islam however changed this mind-set. Allah Subhana Wa Ta’la told the Arabs and the entire Muslim Ummah that “…whatever of misfortune befalls you, it is because of what your hands have earned. And He pardons much.” (Surah Ash-Shura, Ayah 30). No person, animal or object, no day, month or year can cause harm to anyone! We are responsible for whatever happens to us, ourselves! Also, how can any day or month be unlucky or be a portent of bad omens when in fact months and years are formed by the alternation of days and nights which Allah has appointed for our convenience and to help us organize ourselves? The Prophet (SAW) also negated all superstitions and beliefs of the Jahiliyah period concerning the month of Safar. Abu Hurayrah (RA) narrates that the Messenger of Allah (SAW) said: “(There is) no ‘Adwa (no contagious disease is conveyed without Allah’s permission), nor is there any bad omen (from birds), nor is there any Haamah, nor is there any (bad omen in the month of) Safar… ” (Bukhari and Muslim). What is really sad now is that despite having the Quran and the teachings of the Prophet before us, such sentiments of superstitions have crept back into our society. And this is where you and I come in. As conscious Muslims we need to make it a point to shun all superstitions that we come across and direct others to do so too, not only regarding the month of Safar but also otherwise. We must understand that all conditions which befalls us, good or bad, favourable, or unfavourable are from Allah (as a result of our actions). We need to remember that the most unfortunate person is actually he who disobeys Allah’s commandments such as one who does not perform the five daily Salah, not someone who has his path crossed by a black cat or one who weds in the month of Safar. We must not let unimportant and baseless matters of superstitions occupy us so much that we forget to do what Allah has commanded us. Rather, we should remember to keep things in perspective and follow and believe only that which has been revealed by Allah and taught by our Prophet, in order to gain success in this world and the next. “Whatever of good reaches you, is from Allah, but whatever of evil befalls you, is from yourself…” (Surah An-Nisa, Ayah79). May Allah grant us the courage and perseverance to follow what is right and reject what is wrong! Ameen! I would like to make clear all the visitors of my blog that I am not Rqaqi, Aamil, or Spiritual Healer. Any Raaqi you contact via my blog, know they do not represent this blog or me. In my knowledge these are few dedicated places where you can get your spiritual healing according to Quran and Sunnah. I can recommend these places as in my knowledge they works according to Quran and Sunnah; but I cannot be made responsible either individually or severally for any untoward incidents.